Shahid Siraj Din, Pakistan, died after a heart attack and went to Heaven. His death is medically authenticated. The story of Shahid Siraj Din, of Lahore, Pakistan is well known, and widely acclaimed. Shahid Siraj Din died for four minutes after a massive heart attack. This true story comes complete with photographs and medical evidence in the form of ECG tracings performed from the Aadil Hospital, taken by a Consultant Cardiologist. Included in this account is the ECG evidence of his Ventricular Fibrillation, and subsequent Cardiac Arrest. Shahid’s heart stopped beating completely, as confirmed by the straight line on the ECG taken at the time, and faithfully reproduced here. There is further medical support from Shahid’s brother-in-law, Dr Asghar Saleem, a Consultant Radiologist. Shahid was a property developer, and had a severe myocardial infarction on 6th March 1990. He was admitted to the famous Aadil Hospital, in Lahore, Pakistan. 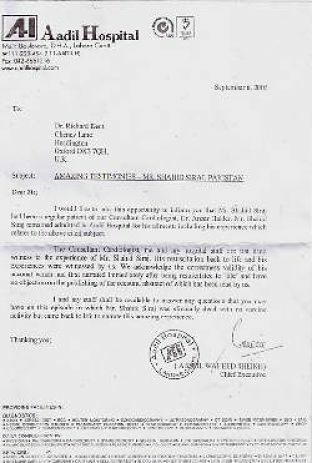 Shahid Siraj Din was a patient of Dr Ansar Haider, a consultant cardiologist. Despite the best efforts of his skilled medical team in the Intensive Care Unit of the hospital Shahid sustained a cardiac arrest. Shahid was resuscitated using cardiopulmonary resuscitation, and received three separate electric shocks to his heart, using a cardiac defibrillator. Shahid was dead for four minutes. During this period he encountered angels and a demon, as well as Jesus Christ. He was ordered to return to this life by Jesus Christ, Who is described here in detail. Shahid was resuscitated after four minutes, using the very best technology available. The ECG evidence of his return to life is here for all to see, and is a testimony of the grace of God, and the skill of Dr Ansar Haider, and his medical team. Shahid’s recovery from such a serious heart attack can only be described as miraculous. The echocardiogram taken by Dr Ansar Haider only eight days after his heart attack showed almost complete healing. After nine days Shahid was discharged from the hospital. Shahid, his family, and the hospital staff, all knew that they had witnessed a miracle. Equally miraculous was the complete change in Shahid’s life. He abandoned his property business, at considerable personal financial loss. He also sold his beautiful family home. With his sister, Dr Tahira Saleem, he set up the Shekinah Churches and Shekinah Bible Institutes in Lahore and Quetta, Pakistan. These are now thriving Christian churches in a predominantly Moslem country. Shahid then became one of the best known evangelists in Pakistan over a period of eight years. On 14th Feb 1998 Jesus Christ called Shahid back to Heaven for the second and final time, after he sustained a second heart attack. Shahid was born and raised in a nominal Christian family in Lahore, Pakistan. His father, Dr. Siraj Din, was a medical doctor and his mother was a nursing sister. He had an elder brother Zahid Siraj Din who was a professor of Zoology, and a sister, Tahira, also a medical doctor. Shahid graduated from university, and then became a partner in a colour photography laboratory. Later he changed his career to the real estate business, which prospered very quickly. In 1990, at the age of 30, Shahid had a successful and profitable real estate business, and worked from his own office. But Shahid was far away from Jesus Christ. He seldom attended church, and never read the Bible, or even prayed. He regularly smoked cigarettes, and spent all his time at his business. Like so many people today, he did not know the Lord Jesus Christ as his personal Saviour. On 6th March 1990 Shahid became convinced that his life should change, and decided that he should submit his life to Jesus Christ. For the first time in his life he fasted and prayed, and asked God to change his life. He was born again, as described in the Bible by Jesus Christ, in John 3:3-7. So Shahid became a believer in Jesus Christ, and his life dramatically changed. That very evening, while he was working in his office, he started to feel very ill. He asked his partner to drive him to his sister’s medical clinic, which was about two miles from his office. On the way he experienced severe pain in his chest, and started to vomit. Shahid soon arrived at the clinic. He was immediately medically examined by his sister and his brother-in-law, both medical doctors. They took him to the Aadil Hospital in Lahore, which was the first hospital in Pakistan to be awarded the prestigious ISO 9002 Certification, where Tahira was a Consultant Gynaecologist. Shahid was seen immediately by Dr Anser Haider, Consultant Cardiologist, in the Emergency Room. Shahid was moved to the Intensive Care Ward, where he was given many injections, and ventilated with oxygen. The entire staff of Aadil Hospital took excellent care of Shahid, but after 30 minutes Shahid’s heart stopped beating, and the ECG on the cardiac monitor showed a straight line, indicating ventricular asystole. The ECG taken at 9.00 p.m. on 6th March 1990 showed Ventricular Fibrillation. Dr Haider diagnosed a massive heart attack, causing the Ventricular Fibrillation. This is a major medical crisis, which is extremely difficult for any doctor to treat successfully. The outcome is very frequently fatal. Shahid’s heart muscle was not contracting normally, and was not pumping blood to the rest of his body. His ECG showed the typical tracing of Ventricular Fibrillation. This was an absolute medical crisis, because the organs of Shahid’s body were not receiving the vital oxygen rich blood from his heart and lungs. The next ECG showed Ventricular Asystole. This straight line on the ECG can be clearly seen. This meant that Shahid’s heart had stopped beating completely, and that he had suffered a cardiac arrest. The alarm sounded loudly on the cardiac monitor. Without medical intervention Shahid was effectively dead. Shahid’s life was now in the balance, depending on the skill of Dr Haider and his medical team. Dr Haider immediately started cardiopulmonary resuscitation. He performed external cardiac massage in order to resuscitate his patient, with positive pressure ventilation of pure oxygen. Dr Haider compressed the heart from the external chest wall, to maintain the circulation. He also established an airway from the mouth to the lungs, and pumped pure oxygen into Shahid’s lungs. Dr Haider then treated Shahid’s heart with electrical defibrillation on three separate occasions. The initial current applied to Shahid’s heart was 100 joules. Shahid’s heart did not respond to the first two electric shocks from the defibrillator. After four minutes cardiac massage, Dr Haider performed a third and final attempt using the defibrillator. On this last attempt the defibrillator was set at the very highest electrical current of 360 joules. There were a number of doctors surrounding Shahid. These were Dr Haider, Dr Tahira Saleem, and Dr Asghar Saleem. Shahid had recovered from a cardiac arrest. He was kept in Intensive Care, and carefully monitored. The next morning a further ECG was taken, which showed only 20% cardiac damage. Dr Haider himself commented that a miracle must have taken place during the night. On the third day he told his sister Tahira about his personal experiences whilst the doctors were attempting to resuscitate him. During his four minutes of physical death, his spirit left his body, and he entered a spirit world which few people have seen, and yet recovered to tell the tale. Shahid’s spirit left his body during the resuscitation process. According to the Bible, as recorded in James 2:26, “the body without the spirit is dead.” According to the Bible, Shahid was dead, although the medical profession would normally wait until resuscitation had failed before pronouncing death. As Shahid’s spirit left his body, he observed angels having a discussion with a demon. The discussion was about whether the angels or the demon would take his spirit, and to which destination, Heaven or Hell. After this brief discussion the demon departed, and Shahid saw the angels beside him, comforting him. Shahid then saw his life revealed to him. It seemed like watching a video film. During this, he saw all of his sins revealed, during his life on Earth. After that he had a most unusual feeling, as he felt himself travelling towards Heaven at a very high speed. He was aware of a new spiritual body that was quite different from his Earthly body. During his journey up towards Heaven, the angels accompanied him. The atmosphere around him seemed like a white cloud, and everything was very peaceful. Then, from a distance, he saw the Lord Jesus Christ surrounded in a glorious bright light, which was radiating all around Him. Shahid said that he had never seen such a light as this on this Earth. The light was radiating from the face of Jesus Christ. He said that Jesus was wearing a crystal white robe, radiating brilliant white light. He then heard Jesus speaking in a soft gentle voice. Jesus gently said, “Go back”. Shahid says he had never heard such a gentle voice on this Earth. A moment later, Shahid found himself back in his Earthly body, now sitting on the hospital bed. The doctors were telling him to lie down on the bed! Shahid also said that during his journey upward to Heaven, he continuously heard the prayer of his cousin Naeem Parshad, who was a committed Christian. Naeem prayed that God would bring Shahid back to life. Naeem was at his home, and received a strong impression that Shahid had died. So he prayed that God would return Shahid back to life, and promised that Shahid would spend the rest of his life serving God. Next morning Dr Tahira phoned Naeem to tell him what had happened to Shahid. But Tahira did not have to tell Naeem anything, because Naeem already knew all about it! Naeem said that, whilst praying, he saw a vision in his spirit of Tahira near Shahid’s body. He then saw Shahid’s spirit leave his body, and travel to Heaven, at a speed that seemed as fast as the speed of light. Naeem had prayed for Shahid throughout the night, and knew that God had sent Shahid’s spirit back to his body for a special purpose. – Normal aortic wall and cusp separation. – Normal mitral valve leaflets’ thickness and excursion. – Normal EF and DE slopes. – No SAM or prolapse. – Normal Right Ventricle but hypertrophied septum, especially around apex. – Normal Left Ventricle dimensions, with reduced movements of apical and lateral wall, with akinetic septum. Shahid walked out of the hospital on the ninth day after his heart attack, and all of his medical reports were virtually normal. Everyone said that they had seen a miracle. “On the 7 February 1985, I had a Near Death Experience in the kitchen at home in front of my 14 year- old daughter. It had snowed heavily, and I had been shovelling the snow to clear a path, when I felt a terrific pain like a knife in my back. I shouted out in pain and my wife, Pauline, and my daughter came out to where I was. They literally dragged me into the house. Pauline thought I had had a stroke, and ran to the neighbours for help. During the time my wife was out of the house, my daughter was present. She said that suddenly my body went rigid, and my arms and legs just shot out. I stopped breathing, and my face changed colour. Not surprisingly, she became hysterical. I felt myself, at that moment in time, leaving my body as I went into a tunnel. Up to that time, although I had been born again many years previous, I had never heard anyone talk about this kind of experience. The sensation was of travelling at high speed down this tunnel. All my natural senses were greatly heightened. The colours were more vivid; my hearing was incredibly acute and everything I saw was manifestly more distinctive than with my normal vision. I had no fear because, being a Christian, I knew the place to which I was travelling was Heaven. Something I really love to do is to travel fast, and so the speed at which I came through the tunnel was a wonderfully exhilarating experience. Approaching the end of the tunnel I saw before me the most brilliant, glorious, radiant light. As I saw the glory of Heaven appearing before me, I head the name of Jesus, seemingly echoing throughout Heaven. ‘Jesus, Jesus’. On the third shout of, ‘Jesus’, I did, as it were, an emergency stop, and my spirit went into reverse. Back I came up the tunnel at top speed, and re-entered my body. I remember that the first thing my mind fastened onto in my body was my hearing, as I became aware of my wife saying, ‘Jesus’. The next thing my mind fastened onto was my eyesight, and I saw my wife, Pauline, and neighbours gathered around me. Later I told them that I knew then that I was not in Heaven because they were certainly not angels. Pastor Rod Lewis is an active Pastor in Staffordshire, England. He is involved, amongst other things, in missionary work to Chernobyl, Ukraine. His church charity, Help Aid Chernobyl Children, visits the Ukraine frequently. On the 11th December 1989 Christine Eastell was a senior Sales Representative. She attended a church, but was not a born again Christian. That night Christine was involved in a serious car accident. She sustained multiple fractures, and was taken to the Intensive Care Unit at Queen’s Medical Centre in Nottingham, UK. “Whilst I was in this limbo state, with the machines in effect keeping my body alive, my spirit left my body. It was very clear, and I know it was not hallucinations caused by the drugs I was on. When my spirit began to leave my body I began to go down into a very deep pit. It is difficult to describe. It was very black and misty. There was no beginning or end, and no sides. I just knew I was in a pit. I kept closing my eyes, and hoping that when I opened them it would all be a bad dream, but nothing changed. It is impossible to find words to describe the fear I felt. I was desperate to get out. When I saw what I thought was a small opening I began to claw desperately. But the more I tried to get to this opening, the more distant it became. It was an impossible situation. All around there were people, just ordinary people. They were in deep pain and despair, and they seemed to be tormented by an enormous sense of guilt, which was reflected in their faces. It is so difficult to describe the depth of despair that was present in that place. If you could put all the pain, hurt and despair in the world together, then that was what I sensed in that place. I was far more aware of the depth of this despair than I was of the people. In the darkness I became aware of an even more evil presence than I had already felt. There, up high, was this creature I just know was Satan. I did not know what to do, because this was not just a dream, it was reality. In my terror I screamed out, ‘I am a Christian, and I belong to Jesus, I should not be here’, but Satan just looked down and laughed a hideous laugh that I will always remember. He said, ‘When I tempted you with worldly things you gave in to me. You belong to me now.’ At that moment I knew it was true. What could I do? There I was in Hell, with Satan, and in total despair. I had thought I was a Christian, but I had not committed my life to Jesus. At that point I thought, ‘Lord, please rescue me’. I prayed for forgiveness, and I remember falling on my knees pleading with Him to forgive me, as I went through everything I had not done for Him. Then I stayed there, because I could not do anything else. But, praise God, Satan is a defeated enemy. Jesus heard my prayer, and He lifted me up from Hell into His presence. I looked up, and there stood Jesus in all His glory. I did not want to leave this place. This was so different to the place I had come from, and now I was in the presence of Jesus. I could feel His love and His peace. I told Him I did not want to leave, that I was happy there. But He told me, ‘No, you have to go back and let others know the reality of Hell, but also the reality of the alternative – Jesus’. As I looked down I saw myself once again in a hospital bed, hooked up to machines, with all my family sitting around. I thought to myself, ‘Do I really want to go back?’ Whilst I wanted to stay with Jesus, I also loved my family and knew I must return. As I began to come down, as it were, and return to my body, I knew without any shadow of doubt that I was going to get well, and I was going to do the Lord’s work. After this experience Christine soon became a born again Christian. Christine Eastell lives in the UK. She has worked closely with Dr Richard Kent, the co-author of The Final Frontier book, and has frequently given her testimony both in the UK and abroad.